HomeUber Eats – Is it disrupting UberX? Uber Eats – Is it disrupting UberX? After close to a week in San Diego at Cisco Live! – I was hooked on all forms of Uber. Cisco really pushed digital revolution and digital disruption as a theme, and I couldn’t agree more. Air BnB – Ok well, it seems like a revolution, and while I have no experience I know people that use it and are happy – except the few people who’s homes have been trashed. So that brings us to Uber, and specifically UberX, and you can google/explore everything you want to know about it but for context let me explain it very simply. 5) Get out, payment is automatic, no tipping, receipt in inbox, for cheaper than a cab. Disrupting taxi’s? You bet, I wouldn’t ever take a cab again, They smell, they are impersonal, the payment is a pain – and receipts are horrible. So what about Uber Eats? In the catchment area below, I have the option of 2-3 dishes per day they can deliver. A selection of the best restaurants (or rated anyway) in town delivering signature dishes hot to your door in minutes, think UberX, but you don’t get in – they hand you food. The entire idea looks great – however what made UberX popular was delivering VALUE and I just don’t see Uber Eats delivering that. The “Just Eat” people have been delivering food to my door with a better selection for some time – ok so it isn’t in 5 minutes, but we all know when lunch hour is. 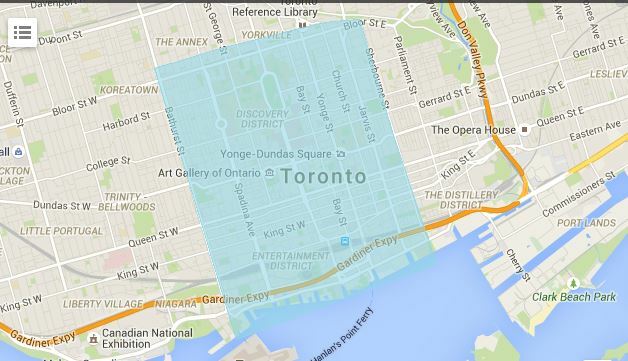 The catchment area is pretty small, and choices for food in these areas, especially in Toronto is pretty plentiful. I could step out to get many quality food options outside my door in minutes just as easily as Uber Eats. The ordering process was great, but $15 later I had 4 quarter sized bits of beef in some tomato sauce and 4 slices of bread. $12 for the food, $3 for the delivery. I expect to pay a premium, but this was less than an appetizer worth of food. Oily like it had been sitting in a car in a heater bag, I didn’t get the cheese that was supposed to go with it – and I went and got another lunch snack later. They generally do not deliver any kind of side, a sandwich is just a sandwich and no drink options except for the occasional “coconut water” for $7 type options which are eco chic but not popular amongst many. I get what they are trying to do – however unless they can deliver must better value this is not going to work. If my hot lunch option could be delivered with a regular type beverage, or a bag of kettle chips, or a bag of nuts or something on the side would be better. Right now the service doesn’t deliver value or a complete lunch offering. Perhaps they should focus on what works for them – UberX, because right now this does not work for me. ← 2015 – Cisco Live! After a year off..